FifteenthCaptain Jintu Gogoi, Veer Chakra Memorial Football Tournament is being organized at Army Polo Ground, Paltan Bazar, Dibrugarh. The tournament will be held from December 16 to 29. 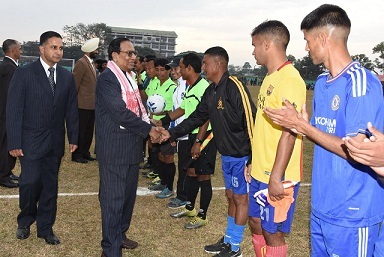 The Dao Division under Operation SADBHAVANA, as a mark of tribute to Kargil Martyr and Assam’s ‘Bir Chilarai’ late Captain Jintu Gogoi, Veer Chakra is organizing the tournament. Dibrugarh-based 9th Battalion, the Rajputana Rifles has given a complete makeover to the historic Polo Ground by landscaping, planting trees, beautifying the area for successful conduct of this year’s tournament. A total of 18 teams (including two girls & 16 boys college teams) will be taking part in the tournament. The inaugural match will be played between Naharkatia & Khowang Girls college team. The event provides ample opportunity to the local teams to participate and showcase their talent. The tournament has received overwhelming response from local population over the years.